The American financial system has two major problems. Together, they are like an iceberg. One is large and obvious. The other is enormous, costing at least 10 times the first. Although this second problem has been present for many years, it has never been perceived as urgent or critical; and so it has been ignored, and is effectively unseen. The obvious problem has been the growth of domestic and foreign debt. Over the last 25 years, debts to American banks have grown at an average rate of $0.8 billion per day. The rate of growth has been increasing. Since the year 2000, it has been averaging $1.6 billion per day. On the other hand, the unseen problem is currently costing the American economy about $23 billion per day, and is growing. This problem has caused the demise of manufacturing and other import competing industries and the reduction of the rate of economic growth. The second problem is a side-effect of policies that President Richard Nixon implemented in 1973 to treat symptoms of the first problem, which at that time was evident as falling foreign reserves. The economic consequences of Nixon's policies are more visible when we consider some of the factors they have affected. For example, as shown in Figure 1, average real wages for production workers in America have not grown, but have fallen since 1973. Real wages for American workers would be about 80 per cent higher today if it were not for the highly promoted yet misguided policies that President Nixon put into effect. Real wages had been rising until 1973. Suddenly, the situation changed and real wages fell dramatically. It is clear that something changed in 1973 that significantly changed the way the economy behaved, putting the USA on a path of self destruction. · suffers the side effects of the policies that President Nixon implemented in 1973. If America is to achieve a healthy and sustainable economy, it needs to address these two basic problems. America shares these problems with many western economies that were prosperous 40 years ago but which are now deeply in debt, and have high rates of unemployment. These problems have spread because President Nixon’s policies have been widely promoted around the World, particularly by the International Monetary Fund. These policies are now a normal part of the modern Western economic framework. Therefore, to even question them opens one to ridicule. Nonetheless, those policies are like the king’s new clothes; they are highly revered but lack substance. Before proceeding to explain the American economic situation more specifically, it is useful to consider the experience of an extremely small and much simpler economy. Although small, it is a useful example because it is a real model and its economy behaves in a similar manner to larger economies. It is more revealing than theoretical models that reflect the preconceived theories of their proponents. In August 1980, I joined the Ministry of Finance of the Kingdom of Tonga as the economist. At that time, the Ministry of Finance was responsible for both fiscal and monetary policy. Tonga had established its first bank in 1974. Before then, the post office provided some banking services. However, it did not lend money. Hence, before 1974, all domestic currency was created through the increase of foreign reserves. That is, when people brought foreign currency into the country, it was converted to Tongan currency and the government held the foreign funds in reserve until the people (particularly wholesale importers) wanted to convert their money back into foreign currency. When the Bank of Tonga was established, it started to create additional money through the growth of bank lending. That money did not increase foreign reserves. Yet it enabled people to spend, just like money that came from foreign sources. Therefore, when the money from bank credit was spent on imports, those addition imports financed by the growth of bank credit needed to be paid for in foreign currency. Those additional foreign payments depleted the governments foreign reserves. Early in 1981, the Ministry of Finance became aware that Tonga’s foreign reserves were being depleted. The Ministry eventually traced the cause of the falling reserves to the growth of bank lending. It found that when bank lending increased, foreign reserves decreased. When bank lending declined, foreign reserves increased. The Treasury realised that if Tonga was to maintain its foreign reserves and the security of its currency, it must manage the growth of bank credit. Consequently, the Secretary of Finance wrote to the Bank of Tonga advising it that if foreign reserves were greater than the equivalent of six months imports, the bank could lend without restraint. However, if foreign reserves were to fall below that level, the bank was to start restricting its lending. If foreign reserves were to fall to 3 months imports, it could maintain existing lending levels (lend what was repaid). If foreign reserves were to fall to 2 months imports, it was to cease lending. In March 1982, Hurricane Isaac devastated most of Tonga’s export industries. Yet Tonga did not experience any balance of payments problems. The Bank of Tonga managed its lending according to the availability of foreign funds. In 1985, Tonga joined the IMF. In its first Article IV report, the IMF commended the government for the success of its lending policies. Although the original policy is no longer binding, Tonga continues to mange the growth of bank credit according to the level of its foreign reserves. These foreign reserves are currently in excess of the equivalent of nine months imports. In such a small economy as Tonga, it is obvious that any growth in bank lending would increase spending and lead to a rise in imports that would deplete foreign reserves. Tonga’s policy response was to manage the growth of bank lending according to its available level of national savings, or foreign reserves. The point to acknowledge from this example is that bank lending creates additional money and it is this additional money that generates the demand for additional imports. Money that is earned enables the income earner to buy the equivalent of what they have produced. In that way, money constrains expenditure to income, or production. But the additional money from banks (created when banks lend more than has been repaid in loan repayments) enables people and businesses to buy more than has been produced. That additional spending causes current account deficits. President Nixon appointed Arthur F. Burns as Chairman of the Board of Governors of the Federal Reserve in 1970 with instructions to ensure easy access to credit when Nixon was running for re-election in 1972. 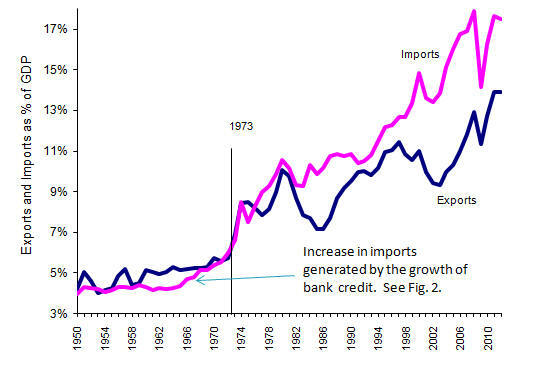 This led to the substantial growth in bank credit which in March 1973 (when the US dollar was floated) reached an annual growth rate of more than 16 per cent as shown in Figure 2 below. As in Tonga, bank lending in America was depleting foreign reserves, including gold reserves. In 1971, President Richard Nixon responded to the decline of US gold reserves by closing the “gold window”. This amounted to treating one of the symptoms of the problem. It did not address the cause of the problem which was the growth of bank credit. Hence, the problem persisted with foreign reserves continuing to decline. When America’s foreign reserves problems were seen to persist, it appears that Milton Friedman and the Federal Reserve convinced President Nixon that the most appropriate approach to resolving the problem of the declining foreign reserves and the speculation on the value of the dollar was to float the US dollar. Floating the dollar was part of Milton Friedman's theory for eliminating economic cycles. He believed that if the rate of monetary growth could be kept stable, economic growth would also be kept stable. Floating the dollar eliminated foreign money flowing in and out of the economy, thereby removing international sources of disturbance to the growth of the money supply. For the Federal Reserve, floating the dollar preserved its foreign reserves. Also, it allowed American banks to continue to lend without restraint. Again, it was a policy that treated the symptom and not the cause. Under the floating exchange rate system, foreign currency continued to be required to pay for the additional imports generated by the growth of bank credit. However, instead of depleting the foreign reserves of the Federal Reserve, the wider economy was required to finance the additional imports. It did this through the sale of equity (selling off the farm) and the accumulation of foreign debt. Figure 3 illustrates how closely the current account deficit has followed the growth of bank credit for the last 25 years. 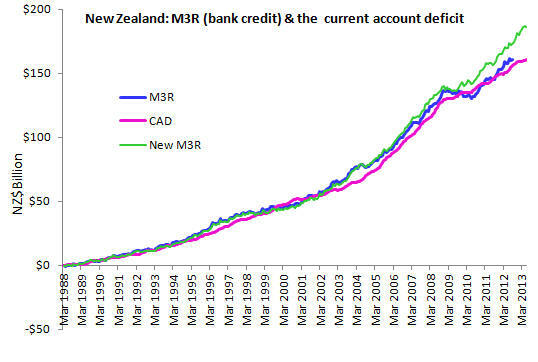 Over that period, the current account deficit has grown at an average rate of $0.8 billion per day. The cost to the economy of bank credit under the floating exchange rate system is clearly visible. The Formula for the Current Account Balance provides a more detailed explanation of the relationship between bank credit and the current account deficit. It is worth noting at this point that the current account deficit has been independent of the fiscal deficit, or surplus. When the fiscal budget was in surplus, between 1998 and 2001, the current account deficit continued to rise, and did so more rapidly. When the fiscal deficit turned from surplus to deficit, it had no effect on the current account deficit. Since 2008, private borrowing from the banking system has declined. However, government borrowing from the banking system (the Federal Reserve) has increased. This has resulted in the current account deficit continuing to rise despite the reduction in the growth of private bank credit. America is not unique with respect to the relationship between the growth of bank credit and the current account deficit. Figure 4 illustrates the same relationship in Australia. Also, it is apparent that there is no direct relationship between the fiscal deficit and the current account deficit. As for America, Australian data for the growth of bank credit must be put together from the available statistics. Changes to the Australian data series in January 2000 has meant that some other non-monetary assets have been included with the bank lending statistics. Therefore, since 2000, it has not been possible to accurately identify the growth of bank credit. 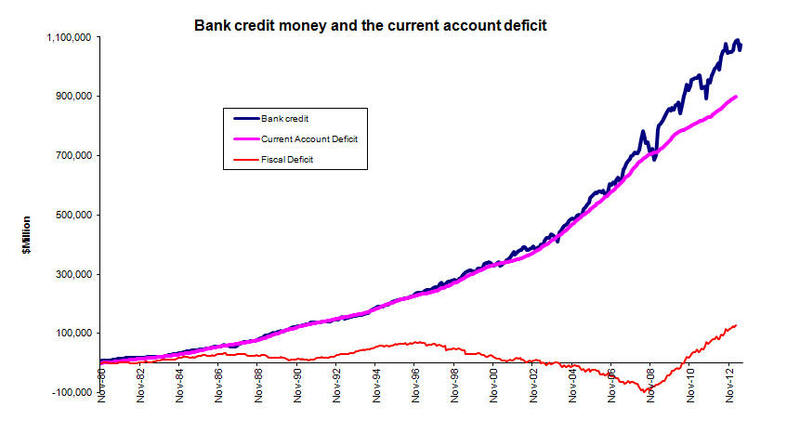 This has meant that the graph of bank credit has not been as closely aligned to the graph of the current account deficit, as it was before 2000. The Philippines had a similar relationship as shown in Figure 6. However, the Central Bank of the Philippines now intervenes in the foreign exchange market to stabilize the currency. Since 2003, the Philippines have experienced current account surpluses and higher rates of economic growth. Y0 is the initial real level of national income or GDP when t = 0. Figure 7 compares the official consumer price index with the index generated, using the above formula. Similar relationships can be found for Australia and New Zealand. the ratio of bank credit to GDP at current prices for each quarter, relative to the ratio of bank credit to GDP in March 1995.
debt that otherwise would have been sustainable would become unsustainable. This would produce a major recession and the failure of banks. The "global financial crisis" is likely to have been such an event for America. It followed a period of rapid credit growth and it was precipitated by the inability of borrowers to repay their debts. The growth of the accumulated current account deficit is roughly equivalent to the growth of domestic bank debt, as was shown in Figure 3. As much of the current account deficit is financed with foreign debt, the growth in foreign debt relative to GDP would have mirrored the growth of bank credit relative to GDP shown in Figure 8. 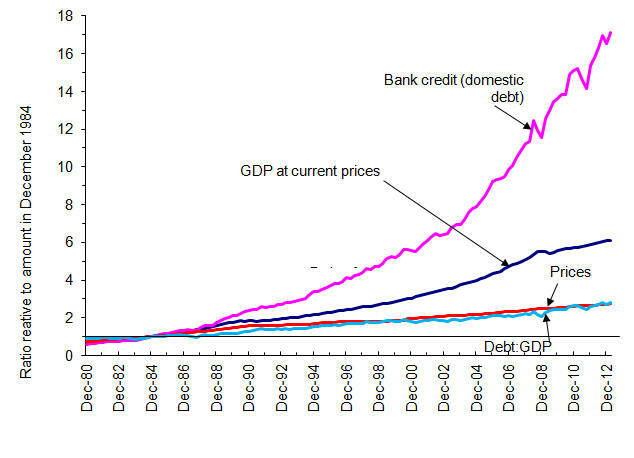 Hence, foreign as well as domestic debts are growing faster than GDP. The growth of these two types of debt is exacerbating the unsustainable nature of the current monetary system. The global financial crisis may have been a transitory monetary crisis and the current monetary system may be able to continue a little while longer. However, if the monetary system is allowed to continue as it has been, eventually, there will be a catastrophic financial crisis that will destroy the monetary system and the economy as we know it. It is not totally clear what aspect of monetary policy has changed since 1995 to increase the ratio of bank debt to GDP in the US. One possibility is that up until 1995, the Federal Reserve had been intervening in the foreign exchange market to manage the value of the American dollar (see the Plaza Accord). Since then, it has changed and adopted a more “pure” float. Australia implemented the floating exchange rate system in December 1983. 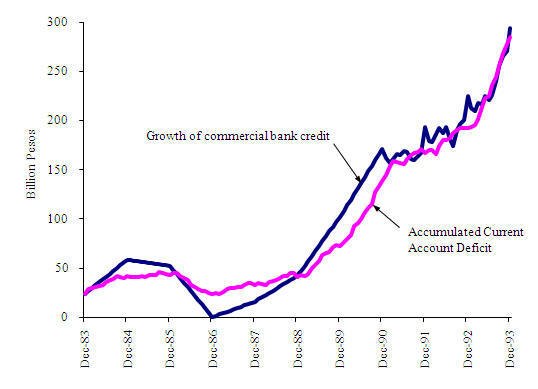 It appears, from Figure 9, that in Australia’s case, bank credit has been growing more rapidly than GDP since the float. This suggests that there have been some differences in the way America initially implemented the floating exchange rate system, or monetary policy, compared to Australia. However, since 1995, America and Australia’s systems have been similar and they have behaved in an identical manner. Although the ratio of bank credit to gross domestic product has more than doubled in Australia since it floated the exchange rate, it has not yet reached the point where the capacity to repay debt has been exceeded. This suggests that initially, Australian borrowers may have been borrowing lower amounts relative to their capacity. We can only speculate on the real reason for the introduction of the floating exchange rate system in America. 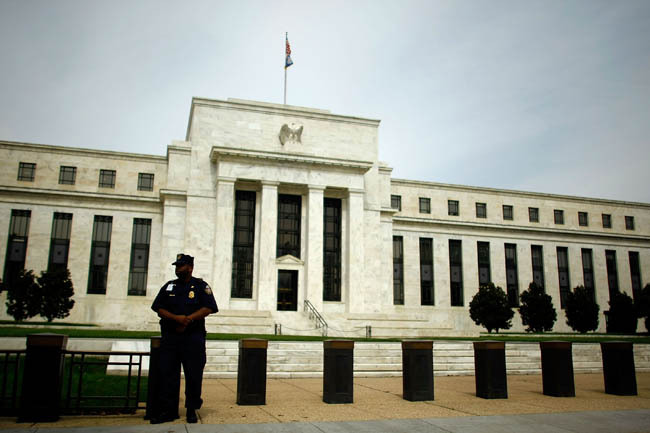 The US Federal Reserve consists of a central board of governors and twelve districts, each with its own board. Frequently, former chief executives of banks progress to become board members of their district Federal Reserve. Only one member of the seven Federal Reserve Board of Governors may be selected directly from one of the twelve district boards. In making appointments to the Board of Governors, the President is directed by law to select a "fair representation of the financial, agricultural, industrial, and commercial interests and geographical divisions of the country." However, it appears that most board members have had a prior association with the Federal Reserve and/or the commercial banking industry. Also, many have had an association with Harvard University which has a particular neo-classical approach to monetary policy. The key committee controlling monetary policy is the Federal Open Market Committee (FOMC) consists of 12 members. In addition to the seven members of the Federal Reserve Board of Governors, there are five Federal Reserve Board district presidents, one of whom is the president of the Federal Reserve Bank of New York. Hence, it is bankers who have been predominantly responsible for US monetary policy. In the early 1970’s, the FOMC members would have been caught in a dilemma because of their conflict of interest. They needed to preserve the foreign reserves of the Federal Reserve. However, they would have been reluctant to implement policies that would have restricted the lending activities of banks. Such policies would constrain bank profitability, an outcome that they would find uncomfortable. Therefore, they may have considered that floating the exchange rate system addressed their concerns. The Chairman of the Board of Governors was closely associated with Milton Friedman, an economist promoting the floating exchange rate system as a means of quarantining the money supply from international influences, thereby allowing a policy of monetary targeting. For the Board, it was a means of retaining their liberal lending policies and preserve the Federal Reserve's foreign reserves. President Nixon, having won the 1972 presidential election with the support of the banking system (the Federal Reserve and the banks) may have been obliged to give the Federal Reserve what it wanted. He would not have received any opposition from the Treasury. Paul Volker was the under-secretary of the Treasury for international monetary affairs at that time. Before Treasury, Volker had worked for the Federal Reserve Bank of New York. Also, he had been a vice president with Chase Manhattan Bank. The banks and the Federal Reserves were attracted to the floating exchange rate system because it eliminated the need for the Federal Reserve to guarantee the convertibility and value of the American dollar by using its foreign reserves to convert US dollars into foreign exchange. The Harvard connection provided the theoretical justification for the floating exchange rate system. It also provided the rational for allowing the collapse of American industries. Their failure was attributed to their own incompetence: their inability to compete on world markets. This spin diverted attention away from the limitations of the floating exchange rate system: a system that in response to export growth, requires imports to rise and displace domestic products (thereby undermining domestic industries). While the floating exchange rate system prevented the depletion of foreign reserves, it also prevented export growth from adding to foreign reserves and creating additional money. That is, it prevented the country from earning any additional income from the growth of exports. Before the dollar was floated, the growth in export revenue would have contributed to national income and savings (represented by the growth of foreign reserves). Those national savings would have offset some of the additional spending generated by the growth of bank credit (also called investment). After the float, bank credit continued to enable people to buy more than they produced, which continued to cause current account deficits. The floating exchange system not only prevented the depletion of foreign reserves, it prevented the accumulation of foreign reserves. Therefore the floating exchange rate system prevented the growth of national savings that could have offset the spending (investment) financed by the growth of bank credit. As a result, floating the dollar increased the magnitude of the current account deficit to the same amount as the growth of bank credit. Under the floating exchange rate system, the main source of new money has been from the growth of bank credit. The economy needs additional money to facilitate economic growth. Therefore, under the floating exchange rate system, the economy requires banks to continually increase lending to provide the stimulus to the economy to enable it to grow. Bank credit continued to grow after the exchange rate was floated, reaching a growth rate of 17.4 per cent in August 1973. Since then, it has not returned to that rate of growth. The rate of monetary growth declined to just 2.9 per cent per annum in August 1975 as shown in Figure 10. 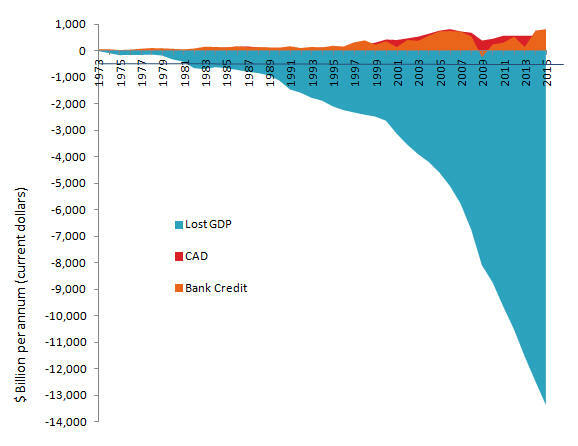 This decline in the growth of bank credit, together with the elimination of additional income from trade (brought about by floating the dollar) combined to cause the recession known as the “oil crisis”. Since the float, the growth of bank credit has largely determined the rate of economic growth and inflation. The problem considered up until now relates to the growth of domestic and foreign debt. However, that problem represents only the tip of the iceberg. The policies implemented in 1973 to curtail the loss of foreign reserves restrained trade within America and between America and the rest of the world. Although the cost of these restrictions have been astronomical, any objection has been silenced, particularly by the financial sector which has profited from the growth of credit. The financial sector has praised the merits of the market determined exchange rate system and sought to associate it with free markets and democracy. In reality, the floating exchange rate system is anti-trade and restricts free markets. It may be illegal because it contravenes anti-trust legislation such as the Sherman Act. It is restraining trade and commerce, particularly with foreign nations. The cost of the floating exchange rate system in terms of income, employment and social welfare is significantly greater than the $0.8 billion per day average increase in foreign debt. America’s real GDP could be at least 60 per cent higher than it is today if it had maintained the average real rate of economic growth experienced in the 25 years prior to 1973. On that basis, the real cost of the floating exchange rate system is currently about $28 billion per day in lost production and income in America alone. Figure 11 shows the lost GDP in America relative to the current account deficits and the annual growth in the amount of bank credit (debt to the banks) to December 2015. As mentioned earlier and shown in Figure 1, one of the areas where the reduction in real income is clearly evident is on real wages. The average real wages of American workers are currently more than 10 percent below the level they were in 1973. This is despite the massive improvement in technology since then. If the real wages of non-farm workers in America had continued to rise from 1973 as they had in the previous 9 years, they would be about 80 per cent higher than they are today. As mentioned above, floating the dollar prevents money from being created through national savings. Instead, the money from increased exports inflates the value of the US dollar. The higher value of the dollar reduces export income and raises imports. To achieve those increases in imports, the floating exchange rate system requires Americans to shift their spending from domestic products to imported products. The floating exchange rate system achieves that outcome by making imports cheaper, relative to domestic products. Manufacturing and other import competing industries have been devastated by the shift in demand from domestic products to imports. As a result, American industry has been undermined. 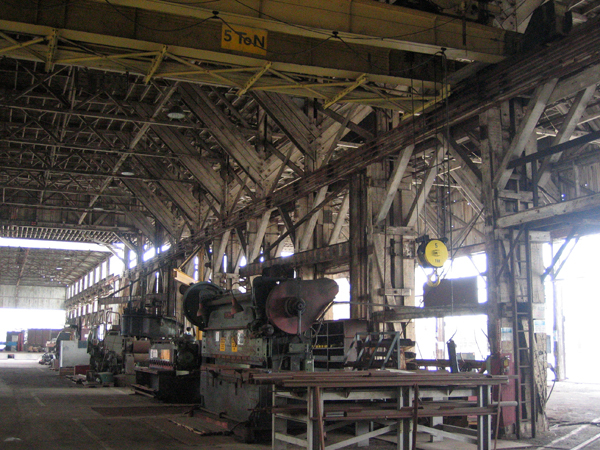 The industrial centres affected by the floating exchange rate system are now collectively called “the Rust Belt”. 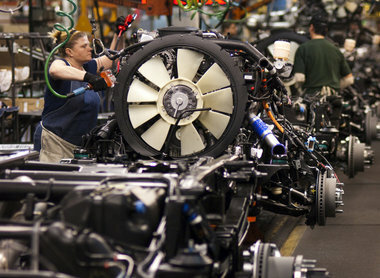 The demise of domestic manufacturing industry has been extensive. Even the American auto industry has been threatened with extinction. The auto industry recently had to rely upon government support to survive. If these industries had prospered rather than been undermined by the exchange rate system, America’s GDP and economic welfare would have been significantly enhanced. 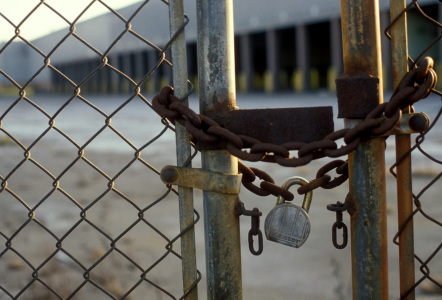 These industries did not cause their own demise. They are the victims of a monetary system that inherently functions to restrict trade and destroy them. Floating the dollar changes the way the economy achieves international balance of payments equilibrium; that is, achieves equality between international payments and receipts. Under the fixed exchange rate system, if America increased its exports, more money would pour into the economy, thereby raising incomes. As incomes rose, Americans would buy more imports. International equilibrium would be attained when American incomes had been augmented sufficiently to increase the level of spending on imports to the same level as the revenue from exports. Under the floating exchange rate system, equilibrium is attained instantaneously through the exchange rate. If exports were to rise by $10 billion, the exchange rate would appreciate to make imports cheaper until spending on imports increased by $10 billion. There is no opportunity for disequilibrium to generate economic growth. Equilibrium is achieved without any increase in national income. The additional $10 billion in income that the exporters earned would have been offset by a $10 billion reduction in spending on domestic products which would have shifted to imports instead. Thus the rise in exports and imports represent a loss of income to American industries supplying the domestic market. Therefore, the floating exchange rate system removes the stimulus previously received from export growth because the additional export revenues are acquired at the cost of lost revenue to the American industries competing with imports. The floating exchange rate system ensures that there is no additional money entering the economy from exports and other international transactions. The export industries may prosper from increased export income but that income is at the cost of lost income for import competing industries. Floating the exchange rate has killed the goose that laid the golden egg for the US economy. The floating exchange rate system requires that the exchange rate appreciate until imports and other foreign payments equal exports and other foreign receipts. Therefore, if all domestic industries were to cut costs to be more competitive and raise exports their efforts would be thwarted by an even higher exchange rate. Also, higher exchange rates make American products less competitive on world markets, and reduce the incomes of exporters. Therefore, the higher exchange rate undermines export industries as well as import competing industries. Figure 12 shows American exports and imports as a percentage of GDP. Before 1973, American imports and exports were stable and below 6 per cent of GDP. Before the float, any increase in exports would have stimulated the whole economy, so that GDP increased with export growth. After 1973, any increase in exports stimulated an equivalent increase in imports. Export growth no longer stimulated the domestic economy to generate economic growth. Also, the higher exchange rates undermined the demand for products from domestic import competing industries. As a result, the growth in exports and imports exceeded the growth of the remainder of the economy. This phenomenon is part of what has been called globalization. Australian international trade experienced a similar trend. In 1973, the Australia dollar was tied to the American dollar. Hence, when the US dollar was floated, Australia experienced an increase in the relative size of imports, similar to the US. When Australia floated in 1983, instead of exports stimulating growth in the whole economy, the relative size of exports increased significantly as shown in Figure 13. Since the exchange rate was floated, the average rate of unemployment in America has increased by one third, from 4.8 per cent to 6.4 per cent. This increase in the rate of unemployment together with the lower level of wages has contributed to the increased level of poverty in America. Figure 14 plots the level of unemployment in America and provides a comparison of unemployment rates before and after the floating exchange rate system was introduced. Inflation has increased, also, since the dollar was floated. Figure 15 charts the US consumer price index since 1939. It shows a clear rise in the rate of inflation since 1973. Long term interest rates have initially increased significantly following the float. From 1953 to February 1973, interest rates for 10 year government securities have averaged 5.2 per cent. Since April 1973, the average has increased to 7.3 per cent, a rise of forty per cent. Interest rates have been falling since September 1982. Since January 2000, average long term interest rates have fallen back to an average of 4.3 per cent. That has reflected short term interest rates that have been lowered in an attempt to stimulate the economy out of recession. Figure 16 charts the interest rate of ten year Government securities since April 1953. Section 2A of Federal Reserve Act requires the Federal Reserve, through the Board and the Federal Open Market Committee, "to promote effectively the goals of maximum employment, stable prices, and moderate long-term interest rates". As evident from Figures 14, 15 and 16, since 1973, the Federal Reserve has been less able to achieve these objectives. Unemployment has been high, prices have been rising rapidly and long term interest rates have not stabilized at moderate levels. While the current form of the floating exchange rate system continues to be in force, it will not possible for the Federal Reserve to be effective in achieving its legislated objectives. Therefore, floating the dollar has restricting the ability of the Federal Reserves' ability to achieve its objectives. While the proportion of GDP earned from exports have nearly doubled, international trade would have been far greater if the exchange rate had not been floated. Higher exchange rates have reduced exports and made American exports less competitive around the world. This arrangements constitutes a restraint of trade or commerce with foreign nations. This restraint of trade has occurred in other countries that have floated their currencies. Consequently, world trade has declined. This was evident immediately after America floated its currency. Ship building industries around the world collapsed as the decline in the growth of trade reduced the demand for the additional shipping capacity being built. Also, Professor Angus Maddison in his book The World Economy acknowledge that "world economic growth has slowed substantially since 1973." Countries exposed to the floating exchange rate system have seen their manufacturing industries destroyed. Also, their governments have been faced with reduced incomes and rising costs associated with supporting their communities that have been suffering from the poor state of their economies. In this weakened state, these economies have been selling off strategic assets such as infrastructure and major industrial assets. In some cases acquisitions by foreign entities have been welcomed. Any possible threat to national security has been disregarded. Also, sovereign investment funds may be used to acquire strategic economic targets such as mineral assets. In the event that economies that are currently being restrained by the floating exchange rate system are released to prosper, they may find that the mineral resources necessary for the expansion of their industries are no longer readily available. Money is the economy’s software that drives its real hardware. Without an efficient and effective monetary system, the economy’s hardware is likely to be left idle. In the interests of the performance of the real economy, the monetary system must be reformed. 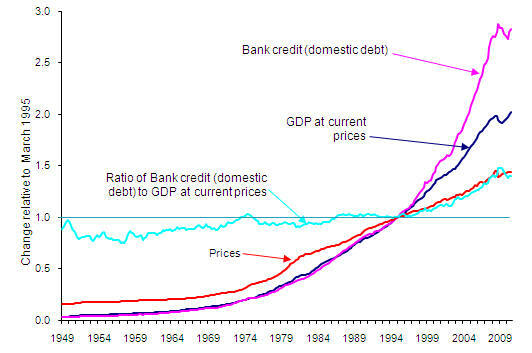 Also, as considered above, the growth of debt under the current monetary system is unsustainable and will eventually lead to the complete collapse of the financial system. Therefore, it is necessary for the long term benefit of the financial system that the monetary system be reformed. The primary change required to achieve a stable and sustainable monetary system is institutional reform. Even if the Federal Reserve believed it was acting in the national interest in 1973, America can no longer allow the foxes to be in charge of the hen house. Government needs to manage monetary policy; not the banks through the Federal Reserve. It may not be necessary to totally abolish the Federal Reserve. However, the Treasury, or some other government institution that does not have a conflict of interest, needs to take control of monetary policy in the national interest. Under the floating exchange rate system, any growth in bank credit is likely to lead to current account deficits. That outcome can be avoided if banks are allowed to hold foreign reserves and, in effect, lend those reserves. Such reserves would generally constitute national savings; and lending such savings does not cause current account deficits. Achieving such an outcome may be more complex than it might first appear. Once savings have been lent, there is little tangible evidence to show that they have existed. This problem can be overcome by requiring banks to hold minimum levels of foreign reserves, or gold, with a central monetary authority and linking the level of lending to those reserves. In addition to these reserve accounts, banks may be required to operate foreign exchange (or gold) based interbank settlement accounts with the institution responsible for interbank settlements. Banks could settle their accounts in US dollars. However, any bank with a credit balance with another bank may wish to convert those balances to foreign reserves so that it can increase its lending. Banks must be able to honour such transactions. Requiring banks to hold foreign reserves or gold ensures that the banks have the savings to fund their lending. If a bank’s foreign exchange settlement account were depleted, the inter bank settlement institution would be able to call upon funds from that bank’s reserve account to make up the shortfall. That action would trigger the suspension of the bank’s authority to increase its lending, until such time as the reserve account was replenished. Note that this does not require the complete cessation of lending. The bank may maintain its total lending at the current level; lending only that which has been repaid on the principal of existing loans. By way of example, banks may be authorized to lend, say, an additional $25,000 for every additional ounce of gold, or foreign exchange equivalent, that they hold in their reserve account with the central monetary authority. Therefore, a bank with the equivalent of 10,000 ounces of gold in their reserve account with the central monetary authority would be able to lend up to an additional $250 million. The reserve account ensures that savings are greater than lending and provides a trigger mechanism to manage excessive bank credit. Capital and other financial requirements for prudential purposes of a financial institution are additional to these macro-economic requirements. The floating exchange rate system manages the exchange rate to ensure international receipts and payments are equal. Under that system the foreign exchange market is required to be constantly cleared: banks are required avoid holding foreign exchange. Under the proposed system, banks would be required to hold foreign exchange. Foreign exchange is required for their reserve accounts and their interbank settlement accounts. In addition, banks may hold foreign exchange in their own right for their own purposes, such as to meet customer demand for foreign exchange. These changes to the foreign exchange requirements would make the current system for setting the exchange rate unworkable. However, it is not necessary to return to the fixed exchange rate system. To give direction to the foreign exchange market, incentives can be provided for the market to manage the exchange rate to achieve economic objectives such as full employment. If we continue with the example in the section above, the amount that banks may lend per ounce of gold equivalent could be reduced by $1,000 for every one per cent of unemployment. If unemployment were 10 per cent, then the amount banks would be allowed to lend would be reduced by $10,000 per ounce of gold equivalent. In that case, they would be limited to lending an additional $15,000 for every additional ounce of gold ore equivalent foreign exchange in their foreign reserve account. Banks make profits from holding loans rather than reserve assets. To maximize their profits they would seek to drive the exchange rate to a level that minimizes unemployment so as to maximize their lending relative to their reserves. Given such an incentive, banks could drive the exchange rate excessively low, causing inflation. To offset the incentive to devalue excessively, a similar incentive mechanism could be established to manage inflation. 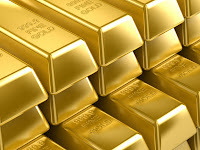 For example, the amount banks may lend per ounce of gold could be reduced by $1,000 for every one per cent of inflation. Thus, if inflation were 5 per cent, the amount banks would be allowed to lend per ounce of gold (or foreign exchange equivalent) would be reduced by $5,000. If unemployment were 10 per cent and inflation 5 per cent, banks would be able to lend an additional $10,000 for every additional ounce of gold in their foreign reserve account. In such a financial environment, banks would act to manage the exchange rate and their lending in a manner that maximizes employment and minimizes inflation. With such a system managing monetary growth, interest rates would no longer be an instrument of monetary policy. The market would act to minimize inflation without direct action from the Federal Reserve. This allows the finance market to set interest rates. If there were a shortage of available credit, interest rates would rise, encouraging savings, discouraging borrowing and attracting foreign investment funds. Such outcomes would increase the ability of the financial market to meet the demand for credit. If the capacity to lend exceeded the demand, interest rates would decline. The financial market would respond to adjust interests rates and eventually drive it towards a stable sustainable rate. The Global Financial Crisis has created some urgency in addressing the failings in the American monetary system. However, that crisis is just one of the many symptoms of the flawed monetary system that has been undermining the American economy. Unless the root causes of these problems are addressed, the problems will persist, and grow. If the American nation is to prosper in future, it must change its monetary system to one that is conducive to economic growth and prosperity. Most likely, many Americans will deny that the problems explained in this paper exist. That is a normal defensive human reaction. However, American manufacturing industries have collapsed. The real wages of US workers have declined. The US, which had financed the reconstruction of Europe after World War II, is now deeply in debt to the rest of the world. These changes did not just evolve. They have been engineered. They are the result of changes to economic policy and unless the policy is changed, US industries will continue to decline and US foreign debt will continue to rise. A similar incident occurred after the First World War. Britain had been a world political and economic power. It had devalued the British pound early in the war and the Chancellor, Winston Churchill, re-valued it after the war. That revaluation caused unemployment and severely damaged the British economy. Although Churchill later realized he had made a mistake, it would have been too embarrassing for him and the government to have admitted the mistake and devalued the pound. So the nation suffered and the British Empire collapsed. As explained above, the US does not need to return to a fixed exchange rate. But, if it does not manage the growth of bank credit, like the UK, it's economy will continue its decline and become a shadow of its former self. 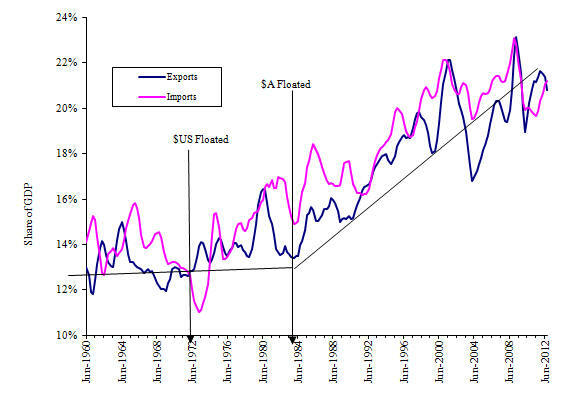 Original charts and data for US graphs are available at: http://www.buoyanteconomies.com/USACAD.xls. These same problems are now causing the excessive rise in domestic and foreign debt. helped them appreciate the effect of their lending on the economy. remain part of Chinese national savings. Impact of the floating exchange rate system on economic growth, wages, employment and trade.